One thing about this time of year--it's berry season. Blueberries are my favorite fruit, and I can't get enough of them. Believe it or not, my husband Pat finds picking them relaxing, so our house is in constant supply. I freeze a few, but I enjoy making and baking. That's how I relax. I'm not in the Sleeping Latte as much these days, but I'm baking up a storm, Blueberry pies, scones, grunt, buckle, and crisp. But you know what gets the best response? The Jordan Marsh Blueberry Muffins. Jordan Marsh was a department store here in New England. Back in the day, their cafeteria (they were cafeterias back then, not cafes) served these amazing blueberry muffins. They also had an Enchanted Village around the holidays in the store, and amazing decorated windows. Jordan Marsh is out of business now, but the Enchanted Village lives on at Jordan's Furniture, and the muffin recipe got released. Once in a while I add some lemon zest, or maybe some orange. But for the most part, I let them stand on their own. Why mess with perfection? Do you love blueberry season as much as I do? What's your favorite recipe? 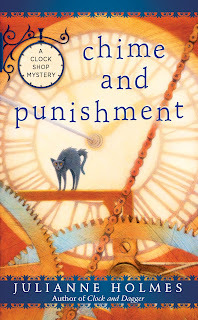 Julianne Holmes is thrilled that Chime and Punishment will be released on August 1. 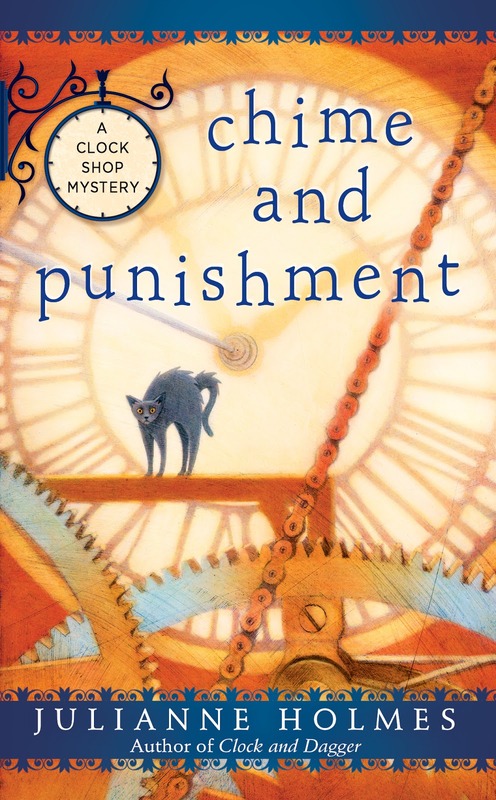 Chime and Punishment is the 3rd in the Clock Shop Mystery series. Speaking of Blueberries. I have 8 GALLONS of them packed in various freezers in the family to make it thru the coming winter. My wife is very health conscious so her breakfast most mornings is a mix of sliced banana, blueberries, sliced apples, melon in season and a cup of Fage plain 2% yogurt. I prefer to put them in the pancakes I occasionally make on Sunday mornings. I love the Clock Shop mystery and own the first two books. I can't wait to get my hands on this new title. THIS IS A NOTE TO THE KILLER CHARACTER AUTHORS!! I distribute bookmarks/cover cards to various library branches here in Brooklyn and Queens County. The Magic Swag bag is currently running on fumes. If you'd like to have YOUR bookmarks/cover cards circulated all over the two counties I'd love to add your stuff to my handouts. Fresh blueberries are amazing in fresh baked blueberry muffins.